What are the benefits of the horn comb ? How to maintain my horn comb ? My natural brush ? The best plan to have beautiful hair in good health. Beauty & care. Shampoos, shaving & toiletry bags. The horn is a natural material, subject to the genetic characteristics ofthe cattle. That is why each comb reveals unique colors. The production requires 14 manufacturing steps. Some steps are entirely manual and requires great dexterity, such as sawing horns, or profiling the grinding wheel. Other steps are mechanized such as contour cutting or sanding. Thomas Liorac is a continuation ofthe history ofthe horn comb industry in Ariege-Pyrenees. The industry peaked in the 1930s by using locally up to 1500 workers. Although the appearance of plastic combs has revolutionized the artisanal sector, they could never compete with the intrinsic qualities ofthe horn comb. Today, Thomas Liorac is constantly innovating to offer customers all around the world high-end products. 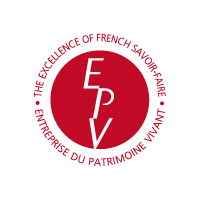 Since 2017, Thomas Liorac has been labeled as a living heritage company : "Entreprise du Patrimoine Vivant". This label is a mark of recognition of the French State to distinguish French companies with craftsmanship and industrial excellence. How does one become horn combs manufacturer? The brand "Thomas Liorac" sells horn combs since 2011. But the supplier could no longer provide enough combs for us. Moreover, the brand wanted to offer its customers, modern designed combs. And also, doing something with our hands, gives an incomparable sense for professional life! But becoming a horn comb manufacturer can not be learnt in a school or in a book! And the last two French manufacturers did not want to take apprentices. Never mind. Grégoire and Marguerite Villedey did conduct a technical study. They acquired machines. They settled in a workshop in the heart of the Pays d'Olmes, in Ariège-Pyrénées (France). And have self-trained for eighteen months. Today, they are proud to be able to offer their own beautiful horn combs, with an excellent quality, according to the high-end brand requirement. Is it a woman making the combs ? Yes. Marguerite is manufacturing and Grégoire selling. 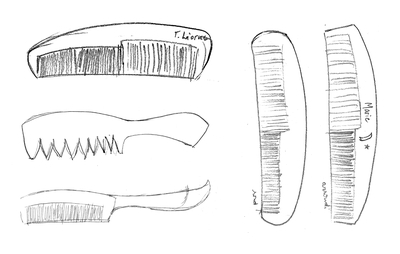 Marguerite invents, draws and manufactures the combs. She operates machinery, organizes production, holds the manual skill and glance. When you consider she was librarian for 15 years, we can say that it is a successful conversion! Gregoire, takes care of shipments, customizations, commercial campaigns, and management.